A mixed bag of anecdotes, best practices, principles and insights related to design. You can start reading it from any page. Discover the techniques behind beautiful design – by deconstructing designs to understand them. The term ‘hacker’ has been redefined to consist of anyone who has an insatiable curiosity as to how things work—and how they can try to make them better. 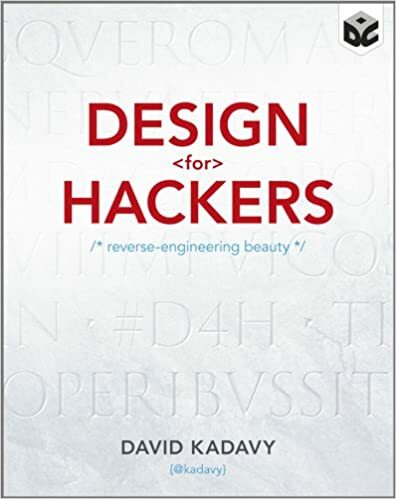 This book is aimed at hackers of all skill levels and explains the classical principles and techniques behind beautiful designs by deconstructing those designs in order to understand what makes them so remarkable. Author and designer David Kadavy provides you with the framework for understanding good design and places a special emphasis on interactive mediums. You’ll explore color theory, the role of proportion and geometry in design, and the relationship between medium and form. Packed with unique reverse engineering design examples, this book inspires and encourages you to discover and create new beauty in a variety of formats. By the end of this book, you’ll be able to apply the featured design principles to your own web designs, mobile apps, or other digital work. Despite the poorly conceived book title (justified by redefining the concept of “hackers”, which I doubt anyone can know that just by looking at the title), the book is a mixed bag of a little bit of everything related to design. It’s not a book about design per se – I’d put it as a preliminary book to understanding the design practices. Just like in any other professions, a designer has a lot to bare in mind to do her work and makes use of different bits and pieces of her knowledge to address different issues or aspects of the design problems (or work to be done). The author gives his shot at explaining what that knowledge may include. A bit of everything: from basic design principles (composition, form, layout, etc. ), color theory, typography to anecdotes like “how Apple started the Web 2.0 style” or the misconceptions about the golden ratio, there’s a decent chance that you can find something you haven’t known. Many explanatory examples: the author shows you what he says, making it much easier to understand abstract things such as design principles. Non-designer friendly: reading the book helps you understand your designer colleagues. Although the book is supposedly intented for web designers, anyone can surely get something that either helps you understand the reasoning behind design decisions, or makes you hold a little bit more respect for the designers in your company. What I don’t like about the book? Well, it’s complicated. Covering an extremely broad topic in a single book has always been a challenge. Some end up with an encyclopedic, thousand-page monsters, some produce high level manifesto-like booklets. And in the age of can-no-focus-for-more-than-five-seconds, a “technical” book becomes every embarrassing with 300+ pages. I really wish it could be a 150-page booklet, even if that meant cutting out more valuable content. You can start reading from any section that looks interesting to you – what’s inside is in bits and pieces anyway. While I doubt you’d find it handy as a reference for retrieving something that’s at the tip of your tongue. So maybe, by reading it either from page one to the last, or by conquering one section at a time, you only need to read it once, and look for other references in your real work.